One cup of suet (chopped fine), one cup of sugar, one cup milk, one cup chopped raisins, three cups flour, with two teaspoonfuls baking powder, a little salt; spice to taste; mix, and steam three hours. SAUCE.--One cup of sugar, one-half cup of butter (beaten to a cream), one tablespoonful of water, the yolk of one egg; heat to a scald; add the white of egg, well beaten, with a pinch of salt. Flavor with lemon. Two cups or suet (chopped fine), two cups of stoned raisins, four cups flour, two eggs, a pinch of salt, milk enough to make a stiff batter; put in a pudding bag, and boil three hours. SAUCE FOR PUDDING. One cup of sugar, one half cup water, yolk of one egg, one teaspoonful butter, one teaspoonful flour. Flavor with lemon. 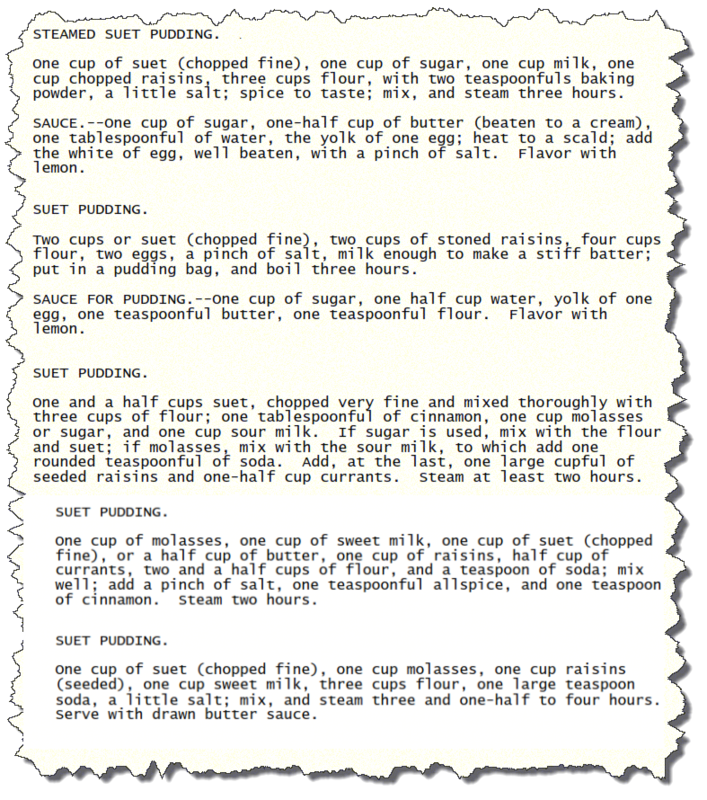 One and a half cups suet, chopped very fine and mixed thoroughly with three cups of flour; one tablespoonful of cinnamon, one cup molasses or sugar, and one cup sour milk. If sugar is used, mix with the flour and suet; if molasses, mix with the sour milk, to which add one rounded teaspoonful of soda. Add, at the last, one large cupful of seeded raisins and one-half cup currants. Steam at least two hours. One cup of molasses, one cup of sweet milk, one cup of suet (chopped fine), or a half cup of butter, one cup of raisins, half cup of currants, two and a half cups of flour, and a teaspoon of soda; mix well; add a pinch of salt, one teaspoonful allspice, and one teaspoon of cinnamon. Steam two hours. One cup of suet (chopped fine), one cup molasses, one cup raisins (seeded), one cup sweet milk, three cups flour, one large teaspoon soda, a little salt; mix, and steam three and one-half to four hours. Serve with drawn butter sauce.